These were perfect for my job! Gotten several compliments. The colors are vibrant and would order again. I love a do it yourself project and used these when restoring a piece of furniture. 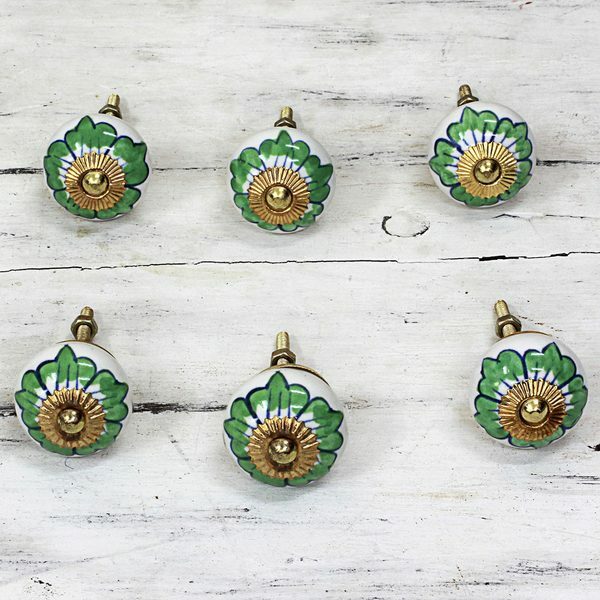 A wonderful addition to any kitchen, these handcrafted ceramic knobs are presented by India's Khalid Ali. Following in the footsteps of his father, he is proud to provide magnificent, yet functional pieces of home hardware. These were the perfect color accent for my white bedroom dresser! They came the same color as the pic. A tiny detail that makes a huge difference with a little pop of green right where I needed it. Price was also excellent. These are beautiful, but the little copper part is super flimsy and bends easily which was disappointing. I am still using them but if you brush past the knobs it could bend the copper. Beautiful, beautiful, just beautiful. Well crafted. Just as I envisioned.